"Ultimately the Champion Hurdle at Cheltenham in March is the aim as I do think that is a test that will suit him well while I wonder if Newcastle could be a little on the sharp side for him. Even so I think he will give a very good account of himself." I'm looking forward to seeing Samcro have his second run of the season in the Fighting Fifth at Newcastle on Saturday. After he had to miss the Morgiana at Punchestown a couple of weeks ago it was always the plan to come here and I've been pleased with how he has been going at home. From what I've seen from him in his recent work there is no doubt that he has improved from Down Royal and our horses are progressing well from their first runs of the season which is encouraging. Having said that Samcro is going to have to step forward as this is the strongest race that he has contested so far. I have the utmost respect for Buveur D'air who has won the last two Champion Hurdles and I was also very impressed with Summerville Boy when he won the Supreme Novices last March. As well as them he's got to take on Bedrock who beat him fair and square at Down Royal. It's just a hell of a race and it's great that we have a horse who is lining up with a realistic chance of getting involved. 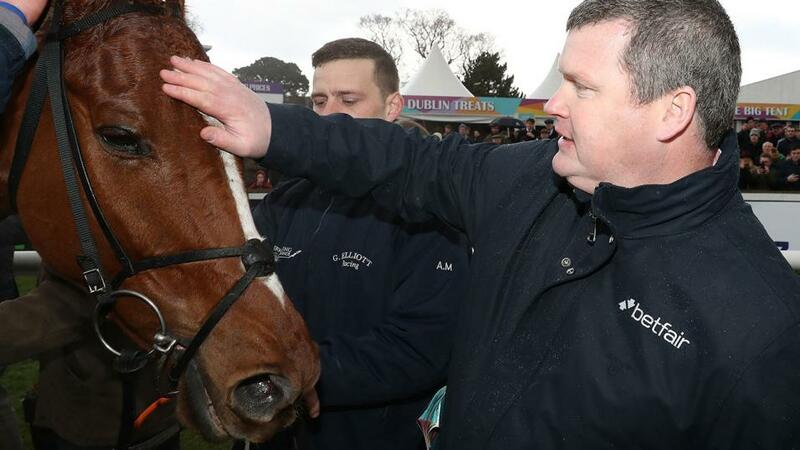 In the aftermath of Down Royal I was disappointed that Samcro got beaten but I do know that he has progressed from that run and that gives me hope that he can put up a strong showing. Ultimately the Champion Hurdle at Cheltenham in March is the aim as I do think that is a test that will suit him well while I wonder if Newcastle could be a little on the sharp side for him. Even so I think he will give a very good account of himself. I've always thought of him as a horse who could really come into his own as a chaser so hopefully this will be the start of a good season for him. He jumps great and is a lovely, relaxed horse with a good way of going and anything from two and a half to three miles this season should be fine for him. For a relatively young and raw horse I thought that he did plenty last season and I'm quite happy to draw a line through his run in the Martin Pipe at Cheltenham as he'd probably had enough for the season at that stage. He's a nice prospect and he should run well. Hopefully she will go close as she steps into handicap company for the first time. She had a straight forward task at Thurles last week and won easily and before that I was pleased with her run in a decent mares beginners chase at Galway where she just got a little tired in the closing stages. She's a grand mare who I think will be able to improve further on what she has shown since coming to us and her initial rating gives her a very fair chance of making her mark in this grade. I thought he would have won over fences before now but he hasn't done much wrong on his last few starts. He jumped great when ridden positively at Navan last Sunday and he did everything right only to be caught late on. The way he jumps suggests to me that he will be able to cope with a step into handicap company and I do think that he could win a nice handicap over this trip. He should run well despite his relative lack of experience. He will start over hurdles in a two and a quarter mile maiden. We had considered just keeping him to bumpers this season but we've decided to crack on with him over hurdles as he has schooled nicely. On his only run last season he shaped up well to finish second in the Land Rover Bumper and I was pleased with his comeback win in a Navan bumper a few weeks ago when he won well from a mare that went on to run very well in a good bumper last weekend. He's a young horse who still has plenty to learn and a few of these will have an edge in terms of experience but he should run well. He didn't get very far in a handicap hurdle at Navan last Sunday so that's why he turns out again quickly. Prior to Navan he'd been off for a good while and he just took some time to come back to himself which is why I wasn't rushing him back to the track. I'm happy with how he is going at home but he will need this run and he has plenty of weight. The decent ground will suit him well and so will the trip but he is probably best watched for now. He will make his debut in a two mile bumper and it will be interesting to see how he gets on in what can often be quite a decent race. I've been happy with what I've seen at home from him for the last few weeks and he is showing that he is ready for a run so this looked a good place to start him out. He hasn't been point-to-pointing so he does lack that experience that several of our recent bumper winners have benefited from and I know that whatever he does here he will improve plenty as a result of this experience.